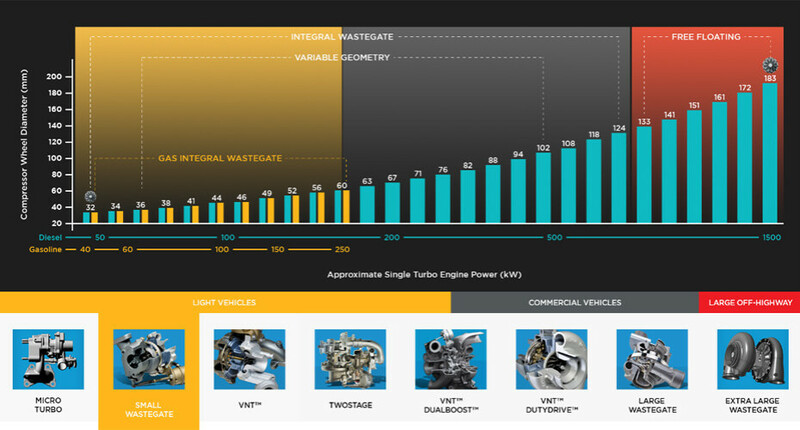 Turbos are fundamental to addressing the auto industry’s most pressing challenges. They dramatically improve combustion process efficiency, enhance vehicle performance and help reduce emissions. No wonder more than 140 million Garrett turbos currently boost cars and trucks around the world. What is and how a Turbo Works? Turbos utilise exhaust gases to power a turbine wheel, which is connected via a shaft to a compressor wheel. As the two wheels turn, large amounts of ambient air are sucked in and compressed. This air is passed through a charge-air cooler to further increase its density before it enters the engine. Turbocharged engines generate more power than naturally-aspirated engines of the same size. And the combustion process becomes more efficient. Furthermore, this helps reduce emissions and enhance the driving experience. In a Garrett variable geometry VNT turbo, a row of moveable vanes positioned around the inlet of the turbine wheel can be adjusted instantaneously to vary the exhaust gas flow through the turbine wheel. This makes it possible to regulate the flow of gas so that a VNT turbo will act like a small turbo at low speeds – supplying more engine boost – while automatically providing larger turbo performance at higher speeds. The ability to vary the mass flow through the VNT enables car manufacturers to optimize fuel efficiency, emissions and driveability. Browse our turbo resources to boost your knowledge base. Get to grips with the Garrett turbo basics covering blow-off valves, wastegates, oil and water plumbing, and journal bearings vs. ball bearings. Step up a level and explore wheel trim, turbine housing A/R and housing sizing, log style vs. equal length manifolds, compression ratio with boost, and air/fuel ratio tuning: rich vs lean. Dive deep into compressor mapping, with guidance on how to estimate pressure ratio and mass flow rate for your engine, and how to plot the points on the maps to choose the right turbocharger.